Does Writing and Revision Get Easier? 1. Starting out with a good plan or outline helps me stay focused. Even though I may revise the plan during my revision process, it helps to look back and see what I was thinking. 3. When I'm writing, I can do a little bit every day to keep the momentum going. For revisions, it helps to have a large block of time when I can read and think about the whole story (like a few days). 4. Details are important, but only after the structure is in place. Looking at scenes with my main character's goal in mind helped me realize some of them were in the wrong place. I moved scenes, deleted some, and melded some together to strengthen the story. 5. There's always room for improvement, but at some point you need to move on. If my novel is in good shape, I can write a one-sentence pitch and summary paragraph that does a good job of capturing the story. One of the things I enjoy about writing is there's always more to learn. I'd like to think that next time, I'll be more efficient and speed up the process. I recently finished writing my second novel, a middle grade about a girl with ADHD who takes up taekwondo. (I have a slightly longer, more eloquent one sentence summary but that’s it in a nutshell!) One of my favorite parts about finishing any project is printing it out. Hitting “Print” is like giving myself a present and I get all giddy. The pages are unwrinkled, the text nice and crisp when it falls into the printer’s tray. Everything is so full of promise. Ahh…. Oops. Sorry. Got distracted just thinking about it. Anyway, here’s one of my favorite revising tips: print your pages so they look like a real book by turning your page setup to landscape and putting your text, single-spaced, into two columns. It’s amazing how much having your text appear like book pages helps you to read, well, like a first time reader. Not only do grammar errors jump out at you, but holes and slow spots in the plot as well as over-used words are easier to see. (“Hi, my name is Carmella and I overuse the word ‘that.’”) Printing your pages this way can also show you were you have too much dialog - or not enough - and if your chapters are an uniformed or varied length. This comic was more appropriate when print submissions ruled. Nowadays, more editors are open to e-mail submissions. The advantage: easier to submit your writing. 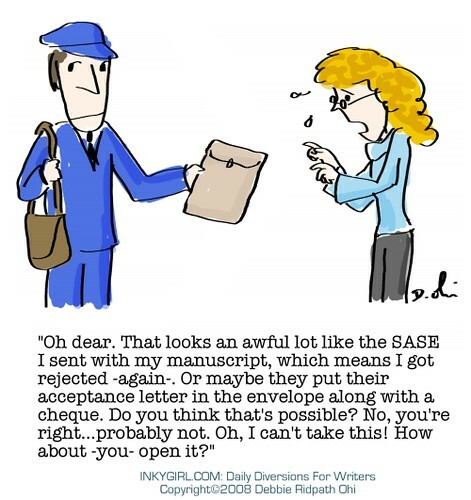 The disadvantage: rejections come back more quickly! Heh. One thing I found so interesting with our contest is reading through the entries and coming across some which made me say, “Hmm… that sounds like something I’d like to read” or “I’ve never read a book like that before” or “I wonder how the author wrote this story”. The premise of a novel is what the story is about and it should peek a reader’s interest, lure them in to read the story. Sure, good writing and a strong voice are the anchor of the story, but it’s the premise that catches an agent’s or editor’s eye and ultimately is blurbed on the back of a cover to pull the reader to buy the book. So the question I’ve been mulling over is: How does a writer find a great premise? 1. Take time to daydream- This is such an important part of a book’s development! Have a notebook handy and jot down notes. Imagine your character’s world and how events could play out. 2. Brainstorm- Don’t limit yourself to one idea. Come up with as many ideas as you can. Write them all into paragraph summaries. 4. Get help- This is where a great critique group or writing friend can be invaluable. Once you have your list of ideas, submit it to your close writing friends. Ask them what they think. What works and what doesn’t. Do they have any ideas that you hadn’t thought of? Don’t be afraid to collaborate. 5. Choose- You’ve got your feedback and you’ve done your research and hopefully you’ve come up with 1 amazing idea for a story. Don’t forget though that even if you think your idea is amazing and brilliant, everyone has personal tastes. What one person loves may be something you hate and would never read. Make sure that your idea is something that you love and are passionate about. Because hopefully it will make it onto the bookshelves and be there for a very, very long time! Holy Swiss cheese on rye, people! Did you ever come through or what? 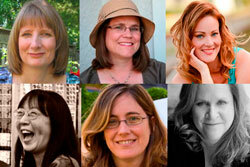 My critique partners and I were blown away by the number and talent of those who entered our humble contest. Here are some cyber chocolate chip cookies for everyone. (Take a napkin. The cookies just came out of the oven and the chips are still gooey.) It takes courage to put your work out there. * They were (for the most part) short and sweet. Hint: try reading your sentence out loud. It shouldn’t take more than one breath. * They told us the important stuff about the main character (age, greatest strength / weakness etc) and about their obstacle or setting. There weren’t a lot of details about theme or what the character learned - just the bare facts. Hint: a good one-sentence summary can often tip a book’s theme without being obvious. * They had a unique plot or a fresh twist on an old story. To determine the winner, each of the MiGs compiled a Top Five list. Then we found any overlapping names and tallied the count. The winner was clear. She was the only person who made everyone’s Top Five list. All the Honorable Mention winners received several votes as well. A jester’s daughter and a painfully introverted princess begin their friendship as the most underestimated young girls in the kingdom, but end up heroes when they uncover and prevent the overthrow of the monarchy. A sixteen year old with a talent for shoplifting leaves her dying father to travel to her estranged mother’s underwater lair, where she makes a deal in exchange for lifesaving medicine that will have repercussions for the residents of this South Carolina tourist town, above and below the surface. In a society where logic reigns and wishes are illegal, Lenore accidentally releases a defective genie. A twelve-year-old girl struggles to forgive her father after he leaves her in the woods with nothing but a smoldering fire and her pest of a brother in this retelling of Hansel and Gretel. Five sixteen-year-old girls of various races develop a bonding friendship while dealing with the stress of being secret teenage superheroes. A sixteen year old FBI profiler wanna-be conducts her own investigation when her older sister is murdered. Congratulations, Susan!!!! (Clap, clap, clap - uh, watch out for the confetti cannon. It's been acting wonky.) Please contact us for critique details. The Group Mind is in Session! Thanks so much for entering the contest, everyone! Reading your summaries has been fascinating. Now all six of us have to discuss our favorites and decide on one winner. Gulp! This is going to be tough because we all love to read in many genres. But even in genres I don't normally pick up, a good hook is a good hook. I can't wait until we announce the winner! Announcing our first ever “ONE to WIN” contest!!! For this contest, we are looking for your best one sentence summary of your book or WIP. We know, we know. How on Earth do you summarize pure genius? We could tell you, but why should we reinvent the wheel? Nathan Branford’s awesome post on summarizing your work in one sentence or one or two paragraphs. Rachelle Gardner’s amazing blog entry about the subject, complete with examples. Contest deadline is Saturday, July 10th at 11:59 pm EST. As a group, the MiGs will decide on ONE winner based on which book we’d most like to read. Rest assured: we are an eclectic group with a wide range of reading interest so no specific genre will have a better shot. The winner will be announced on Monday, July 12th. A critique of the first TEN PAGES of your book! You know how you’re supposed to make every scene count? The same goes for details. As I work on my current novel, I’m learning more about how details fit together to strengthen a story. 2. Details help advance the plot. When I create characters I often give them a specific skill to make them interesting. It’s so much better when that interesting ability allows them to step up and take a stronger role later in the story. With one character, I had an “aha moment” when I realized his interesting hobby allowed him to solve a tricky problem. It wasn’t intentional on my part, but since I had included that detail I used it to shape a more exciting story. 3. Details create emotional connections. We all know how effective this is from dramatic shots in movies (or reality television). The single tear running down a cheek, a perfectly-timed punch, even just a quiet moment of staring into space. Sometimes a small detail is all you need to spark a reaction or make a connection with a reader. Using details effectively doesn’t take brilliant planning. Sometimes all you need is to use what you’ve already got. How are you using details? Tell us about how one detail makes your latest piece of writing more effective.